For over a year now, I’ve had an idea for a beach/market bag in my head. A few months ago, I finally sketched it out, picked up my needles, and starting knitting to see if I could bring the design to life. Well, surprisingly, the bag knitted up rather quickly with no real problem and it turned out exactly how I had envisioned it. 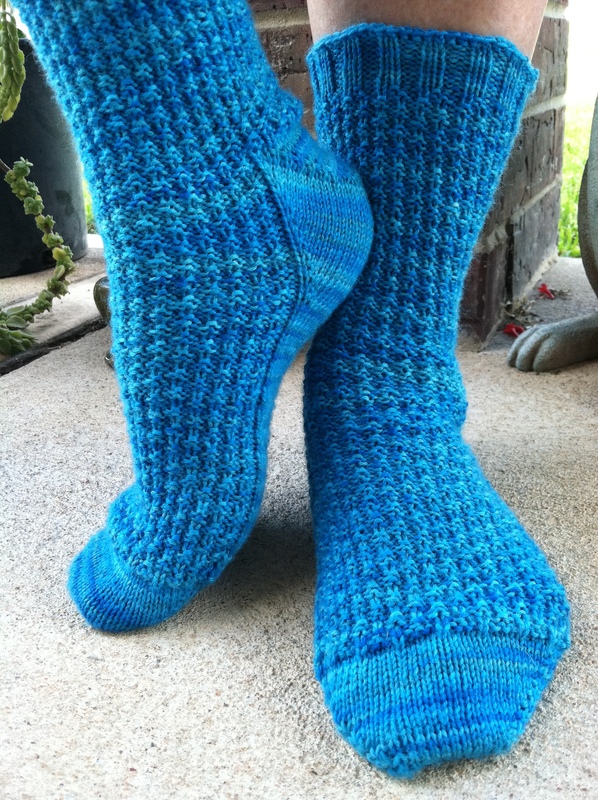 The bottom is knitted in garter stitch and the body is knitted in a mesh pattern with beads. 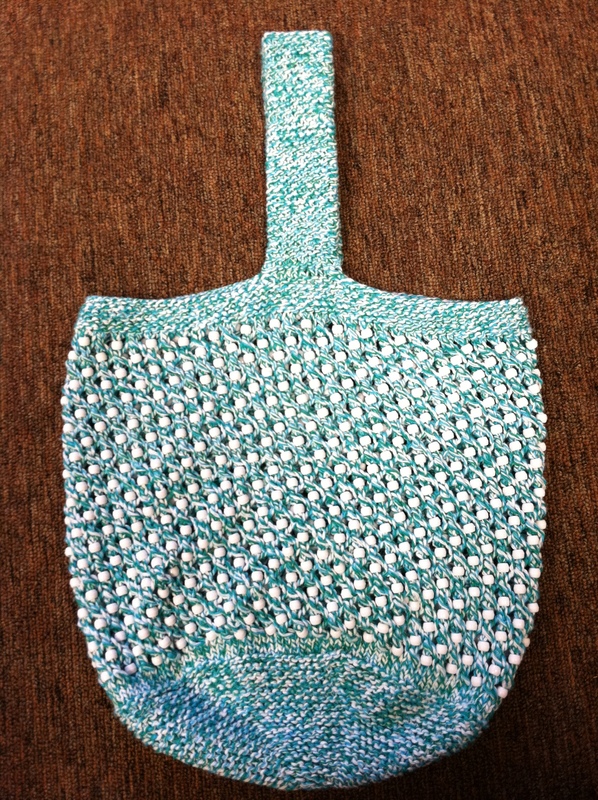 The bag is topped off with a few rows of garter stitch and then a double thick garter stitch strap. The only minor thing that changed from what I envisioned is the strap. Once I saw how stretchy the cotton made the strap, I made it double-thick and shortened the length a bit. I’m extremely happy with the results. I sent my design to Knit Picks, to be considered for their Independent Designer Program and they wrote me back saying they’d like to publish my pattern. I received the support yarn in the mail two days ago and I’m already knitting another bag in Knit Picks’ Dishie. It will be in the color “Swan” and will have multi-colored Perler bead. Knitting with Perler beads is so much fun! Perler beads are sold at JoAnn Fabrics, Michael’s, and Hobby Lobby. I’m sure most stores that sell crafts probably sell them. They are not normally found in the bead section, but in the kid’s craft section. They can also be ordered at http://koolstuff4kids.3dcartstores.com/Perler-Beads_c_24.html. I prefer knitting with the Perler beads rather than pony beads, because the pony beads are larger and heavier and tend to give a little bit of added weight to the bag. I find the Perler beads easier to knit with because of their size. 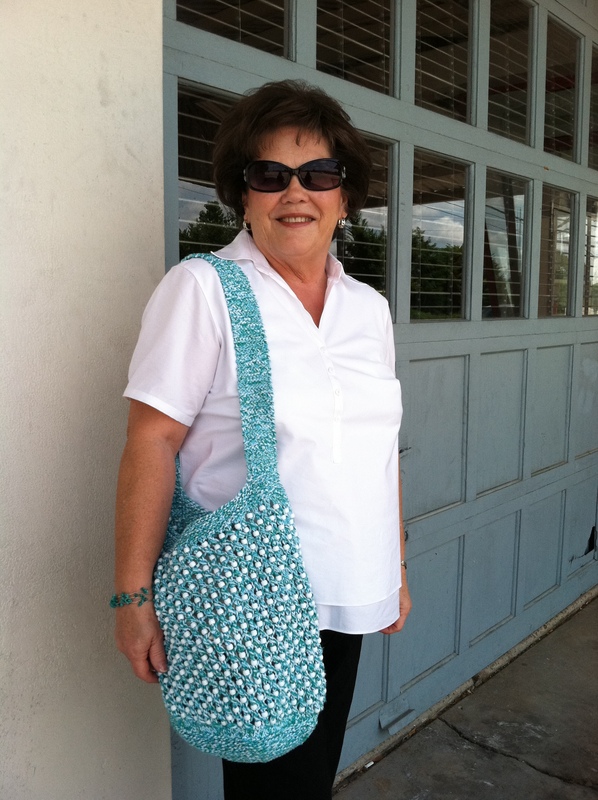 ~Note About Pictures~ The first picture (above) is of my Mom, modeling the bag in Cypress, Texas at an old gas station. This picture was taken before I reconstructed the strap to shorten it and make it double-thick. Below are pictures of the finished bag with the reconstructed strap. 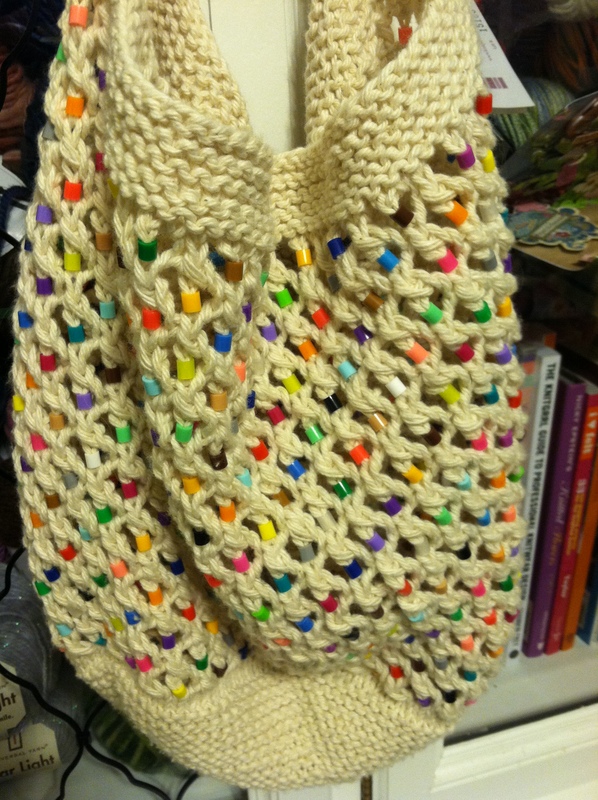 Also, another finished bag knitted from Sugar ‘n Cream with Perler beads. Mom was an awesome model. Only my mom and my dog would put up with my obsessive picture-taking. Thanks Mom!!! 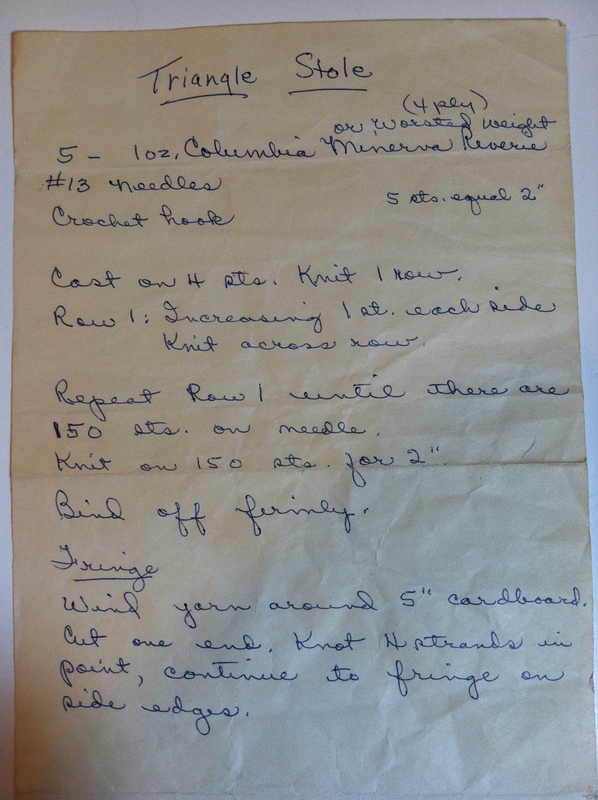 Last weekend, my mother gave me a pattern, written out my by Maw Maw for a triangle shawl, which she found in some of Maw Maw’s old knitting books. I’m assuming that my Maw Maw copied the pattern out of a book. When I saw this pattern, I was so excited. I wondered if Maw Maw had ever got around to knitting it? And if she did, did she use the yarn that the pattern called for? 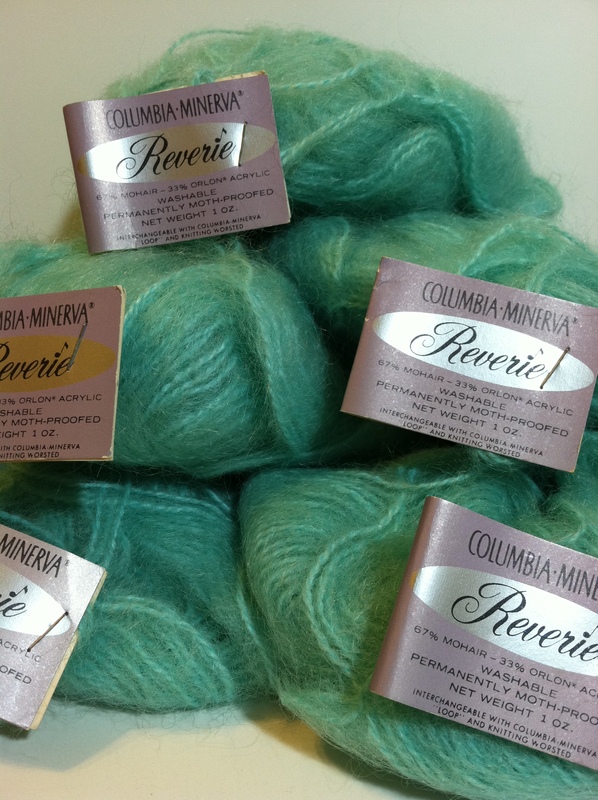 It called for 5 skeins of Columbia Minerva Reverie. I knew I had to make this shawl and out of the same yarn. Ideally, I would have loved making it out of yellow, which was Maw Maws favorite color, but knowing this yarn would be hard to locate, I was willing to make it out of any color. I immediately went searching eBay, Etsy and Ravelry for 5 skeins. I came across another Raveler who had 5 skeins for sale. 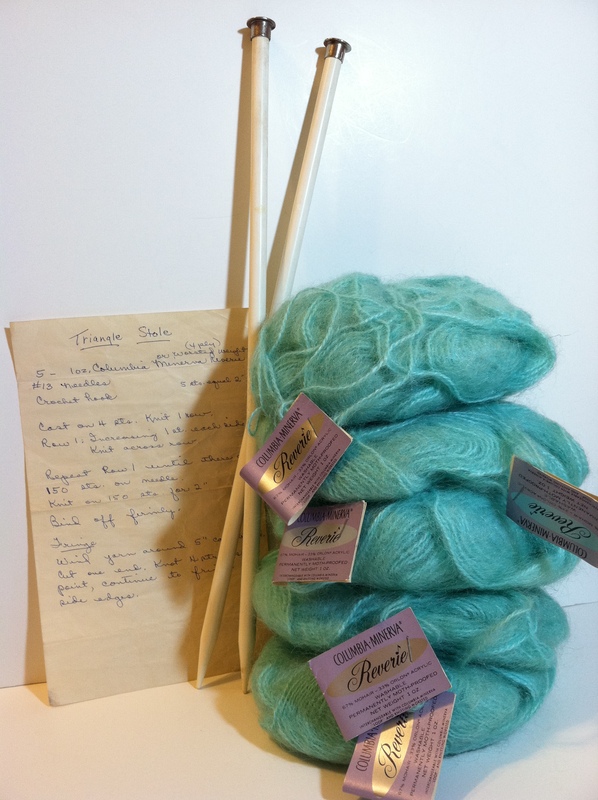 She sold me the yarn in the most beautiful turquoise color, and shipped it out the same day. I was so excited yesterday to find it in my mail box. I casted on last night with size 13US needles, so I know this will knit up quickly. The pattern says to “increase one stitch on each side”. It doesn’t say how to increase, so I pulled out one of my old knitting books and looked up “increase”. The only increase method mentioned was to kfb, so that is the increase I will be using. I can’t wait to get it made and I think I will make me a dress to wear with the shawl. I also plan to frame the hand-written pattern and display it in my craft room. 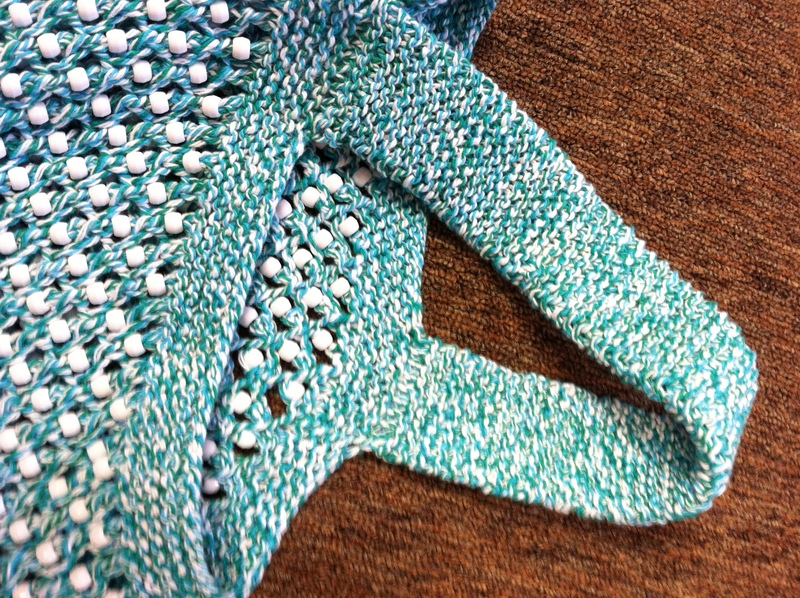 I’ll post pictures of the finished shawl upon completion. As a young child, both my grandmother, who I called Maw Maw, and mother taught me to knit. I knitted off and on for years but didn’t really get serious about my knitting until about 8 years ago. Since that time, I’ve been knitting constantly. I try to knit for at least 10-15 minutes every night. I even take a small knitting bag with me on most days when I leave the house, so that if I get a free minute or two, I can knit. I guess you could say I’m obsessed about knitting. It all started when I was a child. I used to love to watch my Maw Maw knit. At the time I was just learning to knit, and I remember thinking that her hands were like magic. I was mesmerized with the speed in which she knitted, and how she never dropped a stitch, and how her stitches were so uniform and perfect. She had three stackable stools (or ottomans) in her living room near the window, and I would go get one, and bring it over, and sit at the foot of her chair. I would watch her for what seemed to be hours, although in reality it was probably only 10-15 minutes. After that I would give it a try with my needles and yarn. I was never as fast as her and I guess I was somewhat discouraged from time to time about my dropped stitches, my lopsided stitches, and my slow pace. I’d end up putting my knitting down and would opt for climbing trees or riding bikes with my cousins for the rest of the day. But, the next day I visited my Maw Maw, the routine of watching her knit and giving it a try myself would start all over. I don’t think I was ever really good at it until about 8 years ago, when I made up my mind to learn more than just the basic knit, purl, cast-on and bind off. After all, how many plain scarves can one girl have? So eight years ago, I decided to try knitting again. I was intrigued by all the wonderful patterns and thought I should give it another try. My mother helped refresh my memory of the basics and eventually taught me a few more things, such as k2tog, p2tog, sl, yo, and how to do cables. My Maw Maw passed away when I was 26 years old. 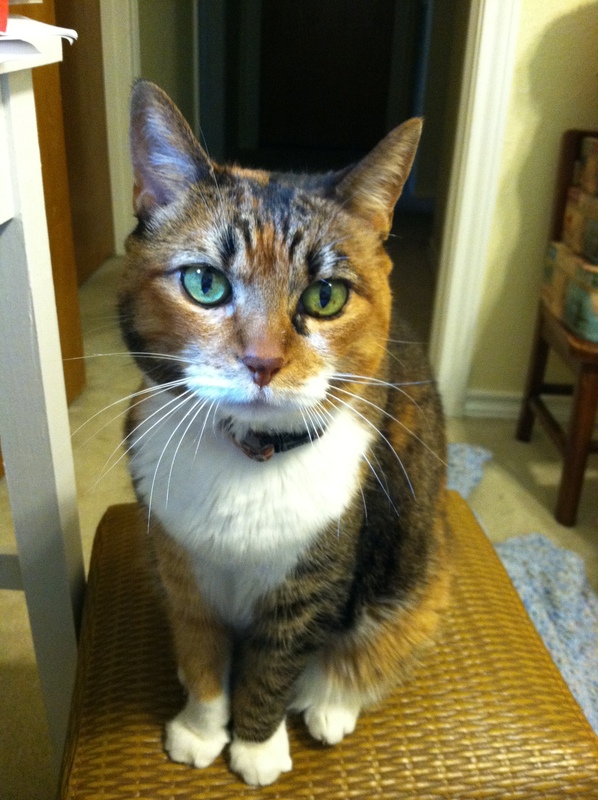 It’s been 20 years now, but I still think of her all the time and miss her very much. I think she would be proud of me and my knitting. I know she would absolutely LOVE going into the LYS around town. When she was knitting, the only place to buy yarn was Leewards and Kmart. When I got serious with my knitting, my mother went through her needle collection and gave me a bunch of old needles that belonged to my Maw Maw and herself. I’ve always kept these needles in a separate bag, so I could remember which needles belonged to my mom and my Maw Maw. Since I now have a craft room, I decided I wanted to display the knitting needles in some way and still keep them separate from my other needles. So, I decided to buy an old white vase to keep them in. I found the perfect vase at an antique store for $6. I love a bargain! I got home, washed the vase up and put the needles in it, but it seemed so plain. 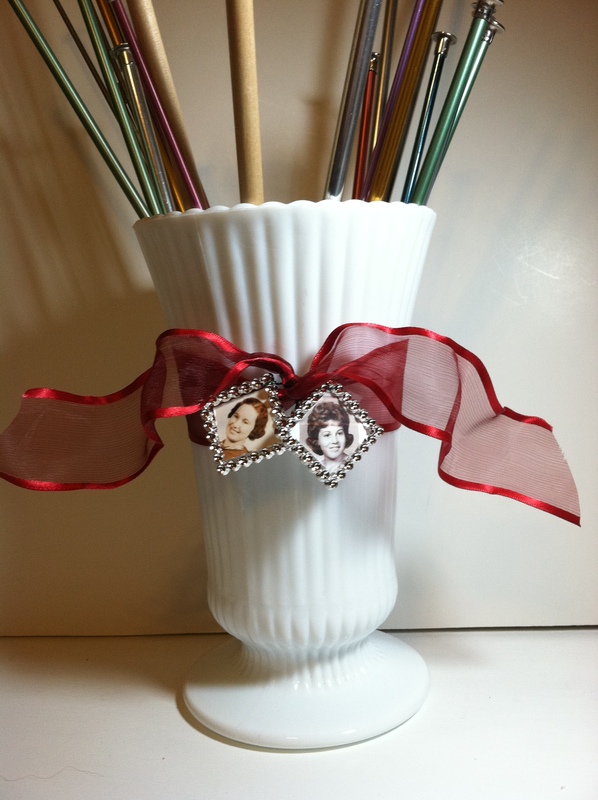 Then I decided to use some extra ribbon I had used in my room, to tie around the vase. I decided I’d hang a small picture of my mom and Maw Maw, since the needles belonged to them. When tying the bow, it just didn’t look right around the bottom, which is what I had originally planned, so I tied it up higher and secured it with a piece of tape on the back since since it kept slipping down. The little frames are actually small belt buckles I bought in a package of 4 at Hobby Lobby for another project, but they worked out great. I’m so happy with how the vase of needles turned out. The vase is now sitting in my craft room on top of my sewing machine cabinet, where I can enjoy seeing the needles every day. They make me think about how grateful I am that Maw Maw and Mom didn’t give up on me and my knitting. I have them both to thank for my love of knitting. 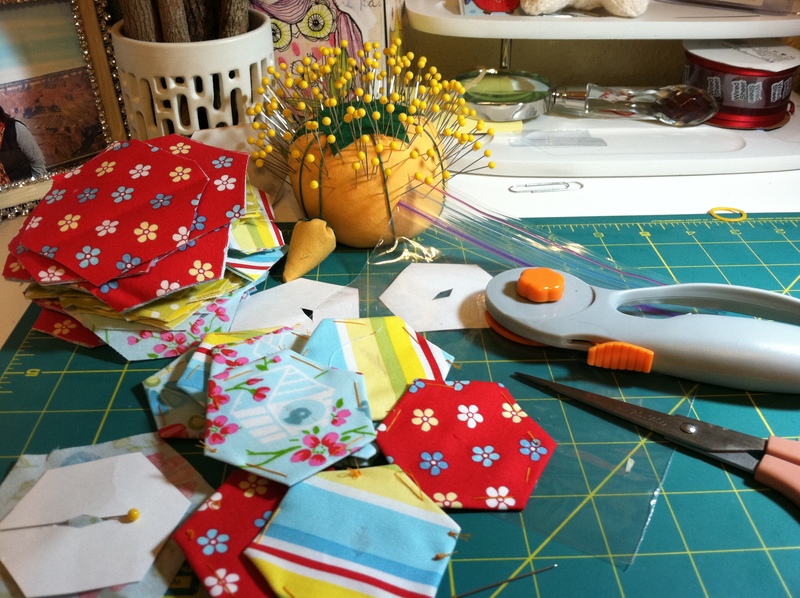 I recently discovered the method of English paper quilting on the Internet and was very intrigued. So much so, that I bought some fabric at the quilt store a few days later to give the method a try. Well, sadly that was as far as I got until last week. Yes, for over three months, this beautiful fabric has been hibernating in a sack in my craft closet. That is, until last Tuesday. I decided to make my hexagons with 1 1/4″ sides. This is smaller than some, but I wanted them small. So I cut out lots of hexagons out of poster board and then started cutting my fabric. Today, six days later, I have a total of 243 basted to the poster board. Yay! I’m not sure exactly how many I will need. I’m thinking I might make a crib size? I want to use it mostly for snuggling up on the couch on a cold day to watch a movie, read a book, or knit. 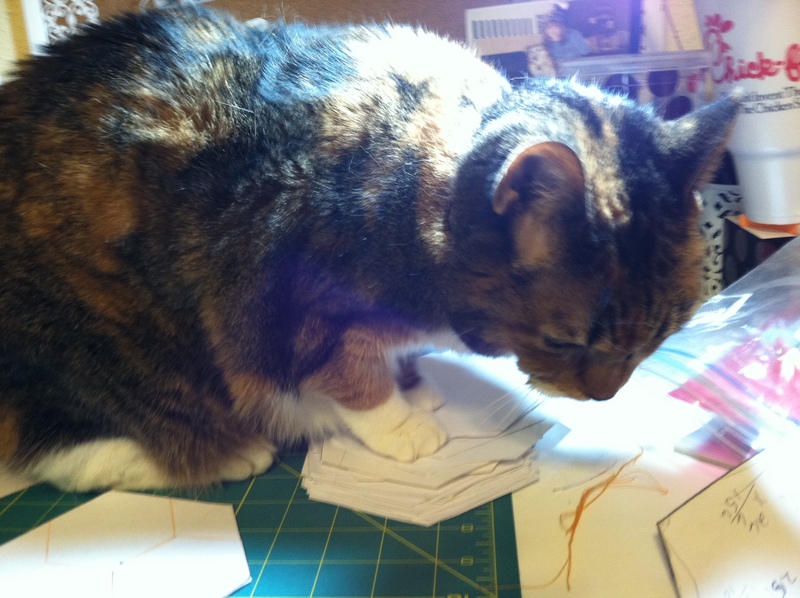 While all this stitching was going on, my cat, Lucy (AKA Miss Lucy Goosey) decided to see what I was up to. She loves to be right in the middle of the action. 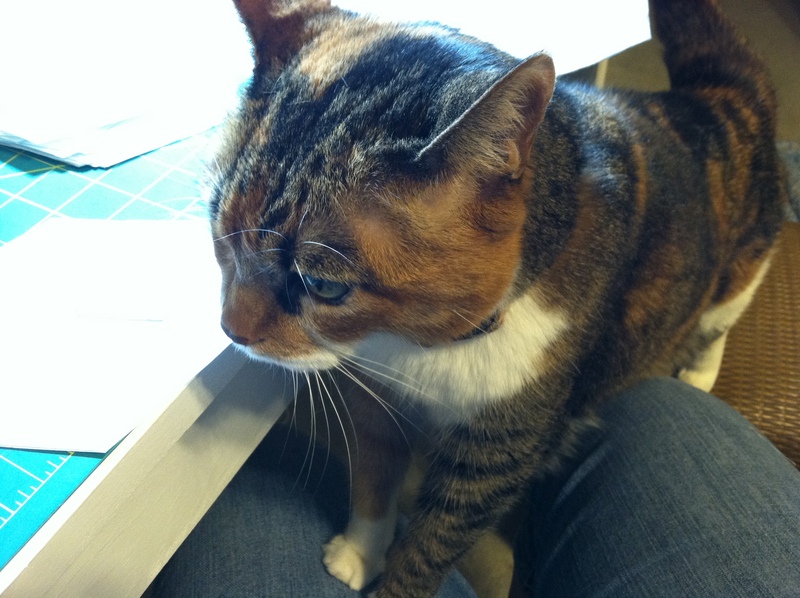 She started off on the ottoman, then moved to my legs and before I knew it, she was on my hexagons. She may be old (going on 15 yrs) but she’s still very curious.